Your VOICE is more than your words. It’s your attitude, your disposition, your demeanor, your presence – your ACTIONS. 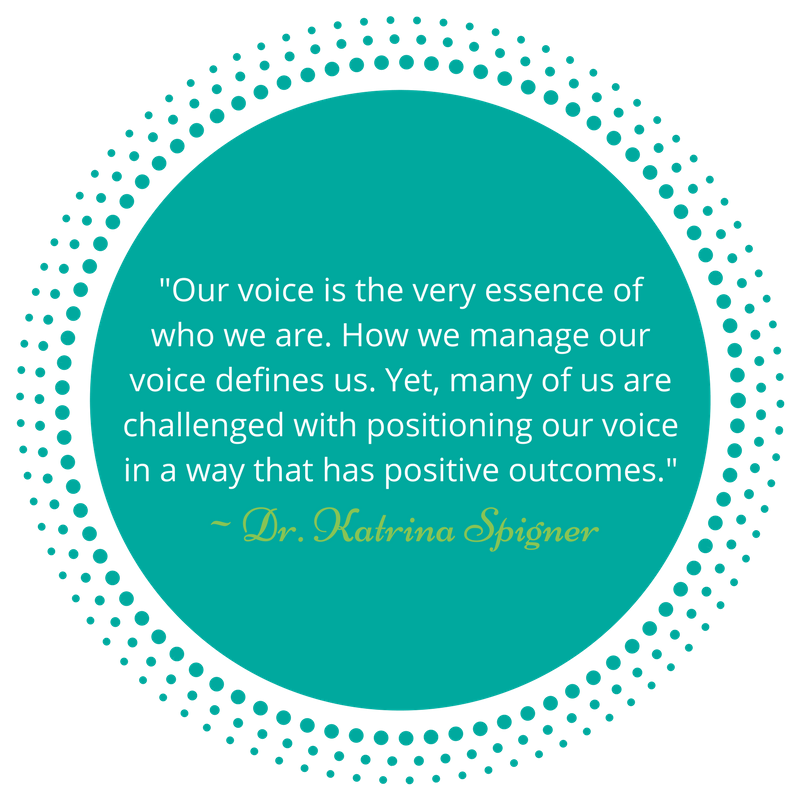 Dr. Katrina Spigner (Dr. K) has focused her research on the power of women’s voices. As a result of her findings, she has developed the “Voice Positioning System™” This system is designed to help you explore, identify, and navigate the power of positioning your voice in a way that allows you to harness your power and master your influence! This Voice Lessons Foundational Course is designed to provide a deeper understanding of the complexities of your voice. In this course, Dr. K introduces voice concepts though a guided journey that explores: 1) what you have learned about your voice, 2) what you believe about your voice, and 3) what choices you make about your voice. Driven by the her research findings, throughout the course, Dr. K asks Coaching questions that help you to think critically about your voice behavior - past, present, and future. This course is the starting point for where you want to POSITION your voice from here! Get ready for the journey! Katrina Spigner, affectionately known as, “Dr. K” is the founder and CEO of Re-Source Solutions, LLC, a personal and professional growth and development company. A Certified Personal & Executive Coach, Consultant, Speaker, Author, and Assistant Professor with nearly 20 years experience as a senior leader in the nonprofit, philanthropic, and higher education sectors, Dr. K’s passion is unmatched and her dedication is in a class by itself, as she is deeply committed to helping people thrive. Dr. K earned a Bachelor of Arts degree from Columbia College and a Masters degree in Social Work from the University of South Carolina. She also earned a certificate in Clinical Pastoral Education. Additionally, she earned her Certification in Personal & Executive coaching from the Coaching and Positive Psychology Institute (CaPP). She earned her Doctoral degree in Education with a concentration in Organizational Leadership from Northeastern University. Dr. K has focused her research on the power of women’s voices. As a result of her findings, she has developed the Voice Positioning System™. This system is designed to help women identify, explore, and navigate the complexities of positioning their voice. Dr. K is the author of three inspirational books: This Is for You! : 31 Days of Life‐Changing Discoveries, G.I.F.T. : Growing In Faith Today!, and her most recent book, COUNTERFEIT: Lies That Cover the Naked Truth. She is currently completing her fourth book, The Voice Positioning System: 7 Ways to Harness Your Power and Master Your Influence. Dr. K’s heart’s desire is to “speak life” each time she is given an opportunity or a platform. As such, she has coached individuals and spoken to audiences all over the country. Whether one-on-one, in the classroom, through radio, television, or in whatever space, her goal remains the same – to touch the lives of others in way that makes them grateful our paths crossed. Dr. K is a member of the International Leadership Association and the International Coaching Federation. If you're ready to understand the complexities of your voice and to embark upon a journey to positioning your VOICE in a way that allows you to harness your power and master your influence, then this Voice Lessons Foundation Course is your first step!